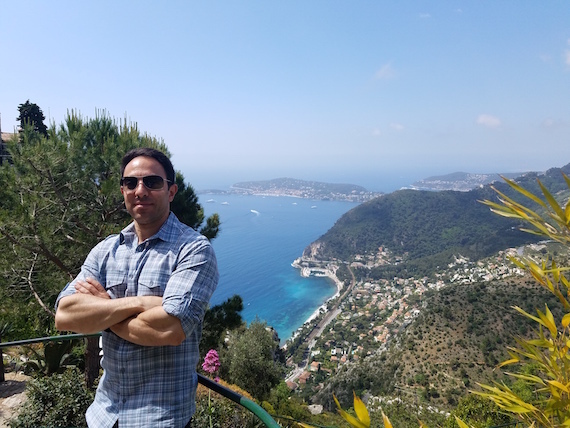 After many years of wanting to visit, this May my mother and I were finally able to book a trip to the Mediterranean coastal jewel of France that is the Cote d'Azur. For a tourist there's plenty to see and do in the French Riviera during the month of May as it annually hosts the Cannes Film Festival and the Formula 1 Grand Prix. 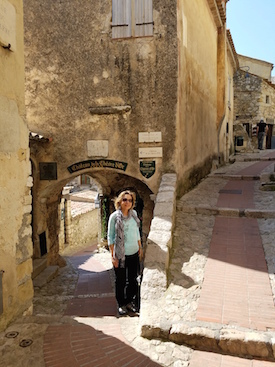 Although we were able to make it to the Palais des Festivals for a red carpet event during Cannes (though stepladders with paparazzi obstructed our view), the highlight of our trip was Eze, a mountaintop village that dates back to the middle ages. 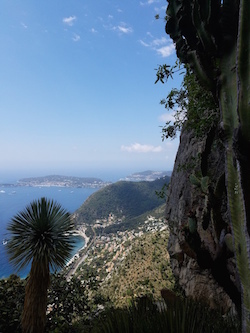 Eze is located between Nice and Monaco, and a convenient ride from either city. As with many who visit the Riviera, we chose Nice as our home base. Nice is a non-stop flight from NYC, and the Nice airport is only a 15 minute ride from the city center, making it a very desirable vacation destination. 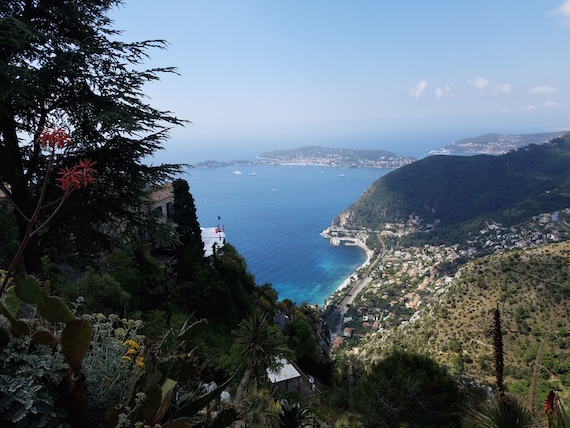 Eze is about 30 minutes from Nice, and even if you have a car, I'd highly recommend taking the bus to get there as parking is very limited, and more importantly, you won't be able to completely enjoy the jaw-dropping scenic ride along the sea and up the mountain. Two bus routes will take you from Nice to Eze. #112 and #82, though on Sundays and holidays only the #82 runs. Although we went on a Monday, it happened to be a bank holiday so we took the #82 from the Boyer stop, a few blocks from the Promenade des Arts (Included my Google Maps screenshot). 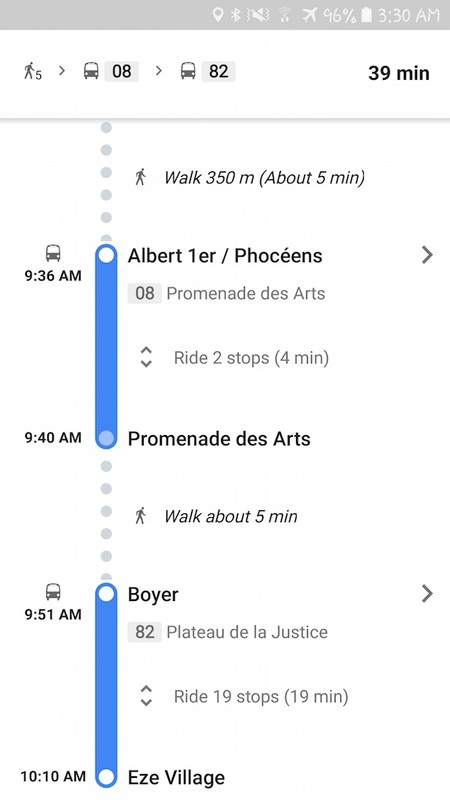 Neither of us speak French, and not every bus stop was marked on the map, so it was a little tricky finding the Boyer stop. Where Nice lacks in signage it makes up for in hospitality (a welcome change for New Yorkers! ), and a combination of helpful locals and fellow tourists pointed us in the right direction. After we boarded, the bus made a handful of stops before ascending the mountain. The winding journey is a preview of the spectacular sights that await as you'll pass parting cruise ships, hillside communities, and docked yachts while crossing bridges over cliffs that overlook the sea. My mom and I were so focused on catching the views that we weren't paying attention to the stops, but when most of the bus began to empty we knew we had arrived. The entrance to historic Eze is only a short walk from the bus stop along with an information center, a small parking lot, and several businesses. There was also a snack cart that served homemade treats which came in handy at the end of the trip. I'm not too sure whether it was my thirst after walking around for two hours in the sun or the brown sugar ingredient, but they had the best lemonade I've ever tasted. Upon entering Eze I felt transported back to the Medieval period while walking up the uneven stone streets through narrow passages and under low archways. Such feelings of being in a museum village quickly subsided as an expensive art gallery, gift shop or cafe could be found around every corner. There's even a 5-star hotel complete with a pool and spa, as well as room doors that line the alleyways. However, thankfully not all of Eze had been to converted to modern tourist trappings. We were in awe after stepping inside the village church as the interior looked like it hadn't been modified for several centuries with its tight rows of rickety pews, melted down candlesticks, and dilapidated walls marred by peeling paint. Just beyond the church is a small cemetery where World War I soldiers are interred in mausoleums. 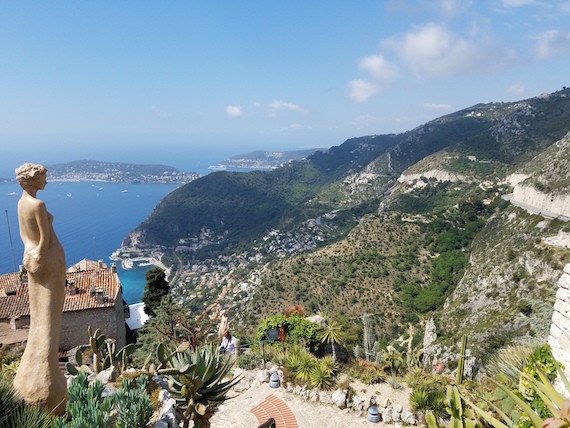 I had researched a bit about Eze prior to visiting as a couple of family members had been there a number of years ago and highly recommended it. 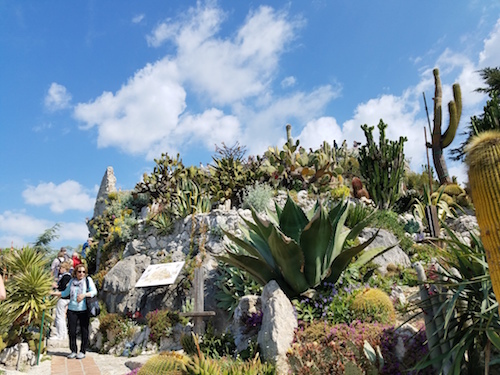 Not only does Eze have a preserved historic village, but it also has an exotic botanical garden. Awarded with a Trip Advisor Certificate of Excellence, the Jardin Exotique d'Èze did not disappoint. Perched above the village on top of the mountain, the garden has spectacular panoramic views of the Mediterranean and the hills below. Stone staircases and paths snake among sculptures, statues, and the countless species of plants and cacti indigenous to the semi-arid climate of the Cote d'Azur. We wandered with delight for more than an hour, pausing constantly to admire the stunning vistas while snapping dozens of photos that would inevitably be shared on Facebook and Instagram. Although the images that we captured on our smartphones will help us remember the natural beauty of the garden of Eze, they pale in comparison to the tranquility that only occurs while being absorbed in the moment. It was amazing standing there at the mountain summit, untethered from typical concerns and routines. The experience was truly sublime. Since returning home to the United States, I've spoken to a number of people who have been to the French Riviera. Regardless of whether they are French or American, I was shocked to hear that not a single one has been to Eze. 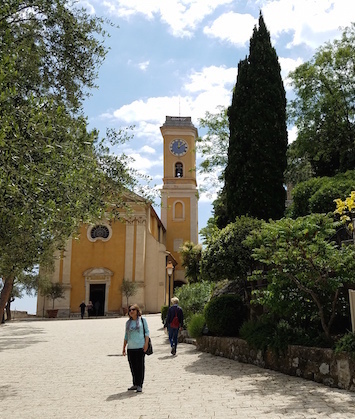 So if you ever visit Nice, Cannes, or Monaco, do yourself a favor and plan some time to enjoy Eze.